With all the confusing and contradictory health claims being made today, it can be hard to sort fact from fiction. Even well-meaning people can misquote or misinterpret health information, and all too often the media reports only the headlines without the underlying facts. 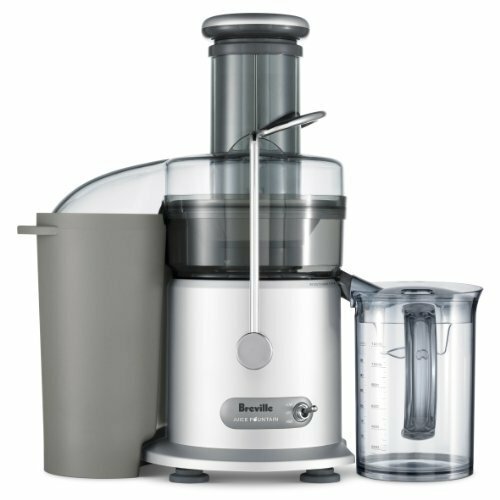 If you are considering starting to add juice in your life, it can be helpful to know the facts about the benefits of juicing. The truth is, many people simply don't have time to take care of themselves as they know they should. We all know we should eat a healthy diet, but making healthy meals with a full range of fruits and vegetables can take a long time to prepare, and a long time to eat. Unfortunately, it's often true that unhealthy choices are faster and easier on a busy schedule. 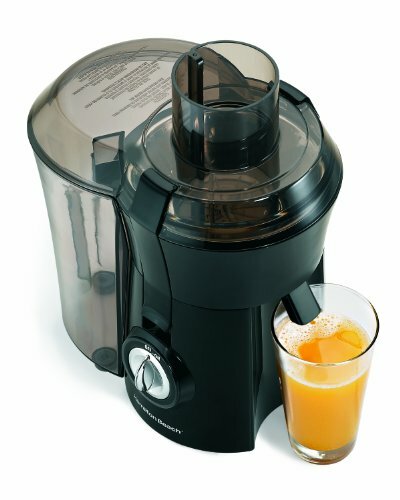 Juicing is a great way to make healthy food choices simple and fast, both to make and to consume. Juice is easy to drink in a hurry, or even take with you on a commute, making it a very time-efficient way to make healthier food choices and take care of your body. Health experts recommend 5-8 servings of fruits and vegetables every day, to get the optimal amounts of vitamins, minerals, and healthy micronutrients that the body requires. However, most people fall far short of that mark. Some fruits, like apples, bananas, and oranges, are easier to eat on the go, while pineapples and pomegranates can take more time and effort to prepare. Many vegetables are delicious when combined in a salad, but salads also take a lot of preparation, and we tend to use the same salad ingredients over and over. We also often add extra fat and calories to salads in the form of croutons or dressings. In other words, when we are saving time and managing a busy schedule, we may tend to eat the same fruits and vegetables over and over again, because some are simply more time-consuming and difficult to prepare. 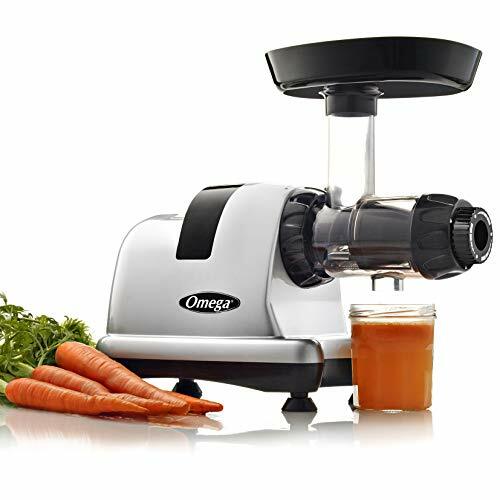 With juicing, not only do you get your full quantity of fruits and vegetables every day, but it's easy, delicious, and natural to use a wide range of produce in your juice. Instead of, for example, looking for recipes that use beets, or broccoli, or sweet potatoes, or trying to figure out how to combine them in a tasty salad, they can simply be added to your juice with no extra time or effort. 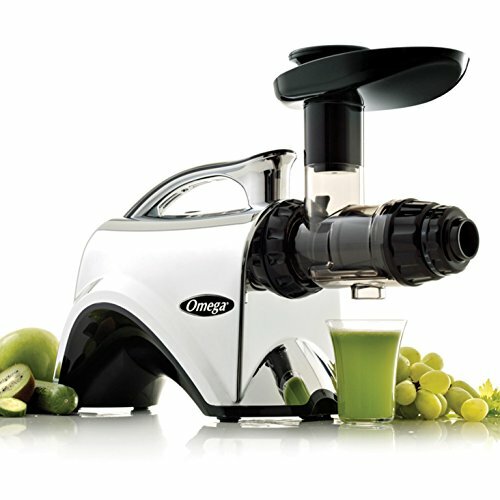 Juicing separates fruits and vegetables from the difficult-to-digest plant fibers. While fiber is an important part of a healthy diet, and keeps your digestive tract functioning well, it can also interfere with the absorption of the vitamins and minerals that are in your food. 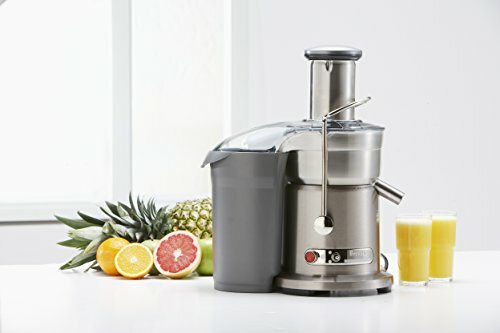 Because juicing extracts nutrients from the fibrous cell walls that contain them, the body can more quickly access and process the pure vitamins, minerals, and micronutrients in your fruits and vegetables, so your body can use them more quickly and efficiently. Without the fiber, juice is less filling than eating whole fruits and vegetables, and has a greater impact on your blood sugar levels, particularly when juice is predominantly fruit juices. However, for those who are sensitive to fiber and who need to get the most nutrients possible from their foods, juice is a great option. Microalgae contain vitamins, minerals, antioxidants, and proteins. They are also prebiotics that have anti-inflammatory properties, making them great for recovery. Beets are full of B vitamins and carotenoids, but their high levels of potassium and magnesium are particularly helpful for hydration. Consider adding coconut water or aloe vera to a hydrating juice for even more health benefits. They are packed with healthy electrolytes and help restore your natural balance when you've become dehydrated. 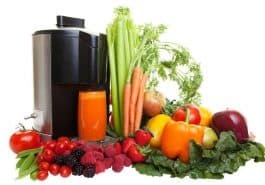 Many people use juice as part of a weight loss plan, and some people do experience weight loss as a result of juicing, but juicing alone is not a weight loss solution. Juices deliver a high quantity of natural, bioavailable nutrition in every glass, and are a great part of a healthy diet. 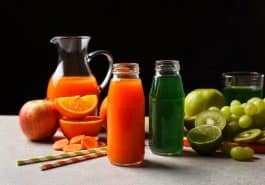 But juices are not intrinsically low in calories, and, when juice is separated from the plant fibers, it is not filling enough to serve as a meal replacement. Juice can be a powerful part of a healthy lifestyle that includes losing weight, but beware of people who claim that juicing alone is a solution for weight loss. 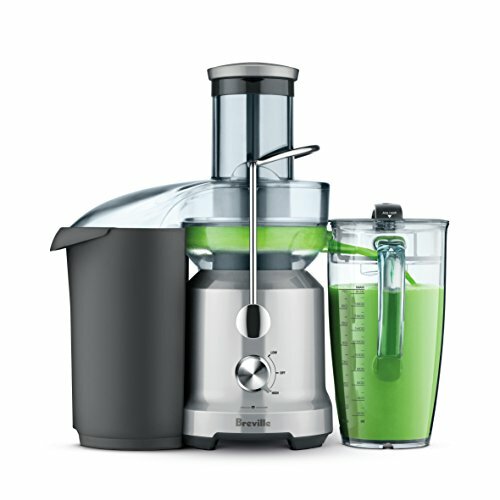 Juicing has a lot of important health and wellness benefits, especially when contrasted with store-bought, high-sugar, low-nutrition juices. It's a fantastic way to increase the amount of healthy fruits and vegetables in your diet, ensuring that you get a wide range of needed nutrients, and that you get them in a way your body can easily absorb and make use of. 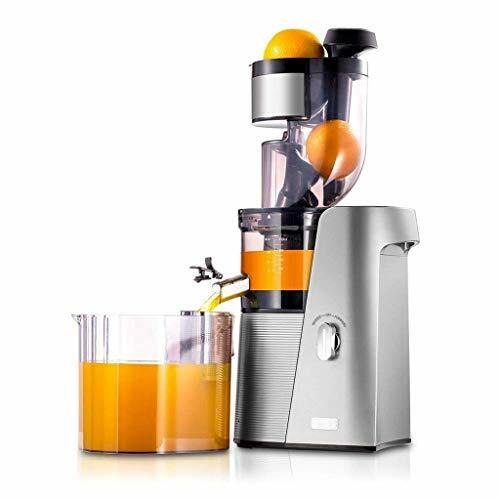 With so many amazing benefits, it's no wonder that more and more people are making juice a key part of a healthier diet and healthier lifestyle. What pan do you choose when you want to fry, braise, sauté or sear? Most likely, a skillet or sauté pan. The similar designs lead some to use these terms interchangeably. However, there is a difference between these two types of pans. We’ll take a look at the differences and discuss which pan to use with a few basic cooking techniques. Is the skillet the same as a frying pan? What is the difference between a skillet and sauté pan? Why is the shape of a pan important? 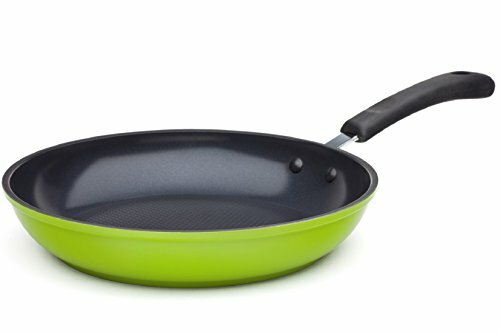 Should I buy a skillet or sauté pan? 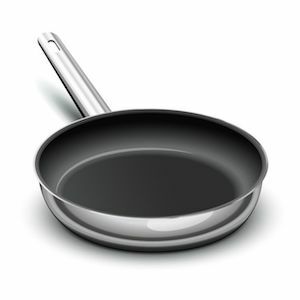 One question that pops up in forums and platforms is whether there is a difference between a skillet and a frying pan. Typically, the terms “skillet” and “frying pan” are used interchangeably because both pans have sloped sides and the depths are about the same. It is interesting, though, that the use and definition of each tends to vary according to the person and the vendor. For example, only the term “fry pan” is used on Vollrath’s company website, while Cuisinart.com uses both “skillet” and “fry pan” in their product descriptions. However, an argument can be made that the skillet has a little bit more of surface area than the fry pan and the sides are not as sloped. A comparison of the French skillet and frying pan illustrates this point. The French skillet has a slightly larger cooking area and the sides are not as flared as those of a fry pan. Another difference is frying pans have a tapered rim while some French skillets do not (i.e All-Clad and Cuisinart stainless steel French skillets). It’s accurate to say that the shape of the French skillet is between a frying pan and a sauté pan. The difference between a skillet and sauté pan is the shape of the pan. A skillet has short, slanted sides while a sauté pan has straight, L-shaped sides. There are different shapes of sauté pans. The sides of some are tall with a narrow base, while others are low and have a wider base. If both pans have the same top diameter, a sauté pan has more cooking surface area than a skillet because the sides are straight and do not flare outward at an angle. Two Vollrath products illustrate this point. Their 12 inch Tribute® 3-Ply Fry Pan has a cooking area of 9 ¾ inches, while the 12 inch Tribute® Sauté Pan has a 12 inch cooking area (per Vollrath customer service). The shape of a pan affects the surface (cooking) area, volume, pan weight and the ease of tossing/flipping ingredients. The straight sides of a sauté pan provide a greater usable surface area than a frying pan of equal top diameter. This allows the pan to hold more volume of liquid than a skillet with sloped sides. When comparing the weight of both types of pans, it is important the top diameters be comparable. If this is the case, the sauté pan is usually heavier than the skillet. The slanted sides of a skillet make it is easier to flip the contents than a sauté pan with its vertical sidewalls. Even though you can sauté in a straight-sided sauté pan, the sloped sides of a skillet make the task easier. However, it is easier to redistribute the ingredients in a sauté pan due to the right angles. The data of two Vollrath pans in the table below demonstrates the differences in cooking area, depth, and weight of a frying pan and sauté pan. Vollrath uses the term “frying pan” instead of “skillet”. 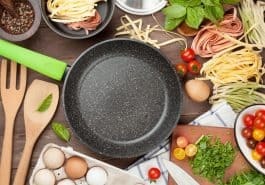 Whether you are just setting up a kitchen or adding to your culinary collection, there are certain pans you need in your kitchen. For some home cooks, one of the decisions is whether to buy a skillet, sauté pan or both. Two factors to consider are the foods that you cook most often and personal preference in terms of pan weight and maneuverability. There is very little that can be cooked in a skillet that can’t be prepared in a sauté pan. However, the skillet has the advantage due to its sloped sides when cooking foods that need to be flipped such as eggs, pancakes, and hamburgers. Many of the same cooking techniques can be performed in both a skillet and sauté pan. However, you might prefer one or the other for a particular method. A skillet or a sauté pan can be used for high-temperature searing or browning meat. If both pans have the same top diameter, one advantage of using a sauté pan is that the straight sides allow for more usable cooking area. On the other hand, some cooks believe a skillet (with the same cooking area as a sauté pan), is better for searing because moisture evaporates quicker in a pan with low sides. Regardless of the type of pan chosen, it is important not to overcrowd the pan. 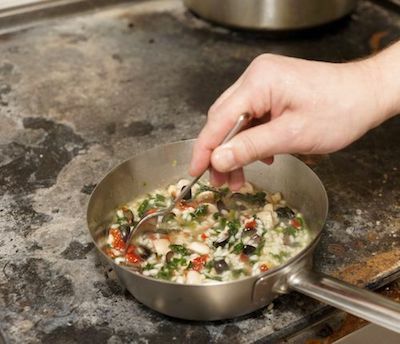 The sauté pan is preferable when making a sauce, or cooking something with a sauce since the liquids are less likely to spill over the sides due to the tall, vertical sides and the sauté pan having a bit more depth. Sauces can be reduced in both a skillet and sauté pan. The pan with the largest surface area will yield the fastest results. Additionally, the higher sides of a sauté pan prevent spillovers if you are stirring during a reduction. The same is true if cooking with liquids. A sauté pan is better suited for braising than a skillet or frying pan. The vertical sides, wide diameter and depth provide enough space to braise properly. Others think the higher, vertical sides are a benefit when shaking the pan. If you plan to add sauce to the meat or other sautéed food, then a sauté pan is preferable. A skillet or sauté pan can be used for poaching as long as the pan can hold enough liquid to completely submerge the food being prepared. When pan frying, the choice is in part dependent upon what dish is being prepared. If the ingredients need to be moved around and/or turned over, then a large skillet with low sides is preferable. It is more convenient and there is less of a concern about hitting your hand on the rim of the pan. However, if you are frying something that needs liquid added, the high sides of the sauté pan would be better than the low, flared sides of a skillet. Regardless of whether you decide to buy a skillet or a saute pan, pan material and construction are two important factors. Bare stainless steel is more versatile than a pan with a nonstick coating system. It can be used to prepare foods and sear at a higher temperature and is the best material for “fond” (small bits of caramelized food that stick to the bottom of the pan which can be used to make a pan sauce). Pans with triple-layer construction are preferable to those with just one layer. Generally, tri-ply stainless steel has an aluminum core between two layers of stainless steel. This combination works well because although stainless steel retains heat well, it is a poor heat conductor, while aluminum is a great conductor of heat. The result is a pan that holds heat from the cooking surface to the rim and provides even heat distribution. Disc bottom (disc clad) and fully clad are terms used to describe stainless steel cookware construction. A pan with a disc bottom has an aluminum alloy or in some cases a copper disc, between two layers of stainless steel. Heat is spread around the base of the pan but not up the sides and sometimes not even to the edge of the sidewalls. A cladded pan is one in which the non-handle part of the of the pan is made from one sheet of multi-layered metal. The result is that the base of the pan and the sidewalls have the same materials and thickness. One factor to consider when deciding whether to buy a disc bottomed or a cladded skillet is to think about what dishes you frequently cook. If you only use a skillet for eggs or pancakes, then a disc bottomed pan is just fine. However, if you use a skillet for a variety of foods, then a cladded pan is preferable since the heat is distributed to the sides of the pan. The folks at Centurylife.org point out that if you cook on gas, a cladded sauté pan is recommended (unless the disc base is oversized) so the “ring of fire” effect can be avoided. 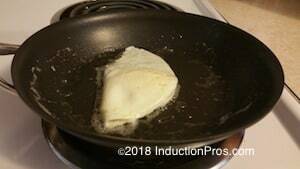 If you are using an induction cooktop, make sure the pan is induction compatible. Materials that work on induction cooktops are steel, magnetic stainless steel, and cast iron. While it is nice to have both a sauté pan and a skillet, having one or the other will work fine for most home cooks. The choice depends upon which dishes you prepare most often and personal preference in terms of weight and how the pan handles. A skillet is more practical if you cook a lot of foods that need to be turned and flipped and don’t want a heavy pan that is hard to maneuver. However, if you prepare large amounts of vegetables and meat, frequently make sauces or cook foods in sauces and liquids then a sauté pan is probably the better option. 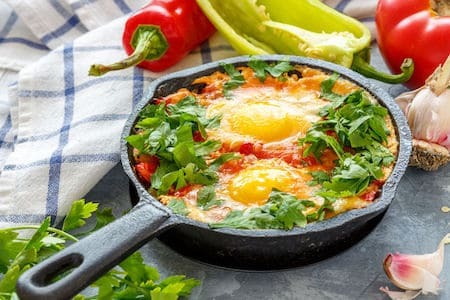 If you do not have any other pans and use a wide variety of cooking techniques, a sauté pan is more useful since it holds larger volumes of foods and keeps liquids and heat better than a skillet. Many of the same cooking techniques can be performed with either a skillet or sauté pan. They can both be used to sear, sauté, pan fry, and stir fry. However, a sauté pan is better suited for slow simmering, braising, poaching and making sauces. 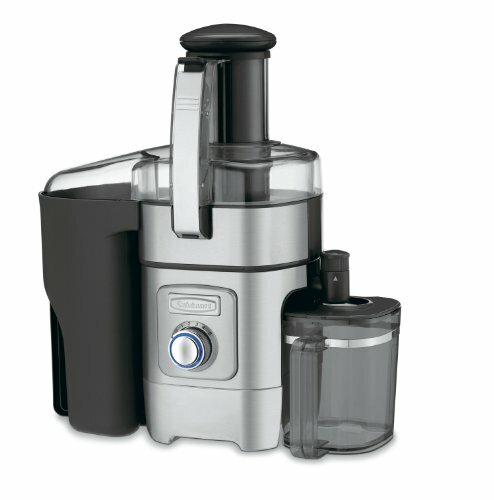 The key is to choose the one that works best for the meals you cook most frequently. When meat is seared or vegetables or meat is brown, small bits of food caramelize and stick to the bottom of the pan. This is known as fond. These bits can be used to make a sauce to spread over your food. It is a simple process to create the sauce. After the food has been removed from the pan and the fat drained, add a liquid such as stock, water or wine. Once the liquid begins to boil, scrape and stir the brown bits until the liquid has been reduced by about half. Add seasonings and the sauce over your food. Why is it important to not overcrowd the pan with meat? Regardless of which pan you use, if you are pan-frying, searing or sautéing, it is important to not overcrowd the pan. As soon as the meat touches the surface of a hot pan, moisture is released. If the pan is jammed with meat and the temperature is not high enough, steam will be produced. The meat then cooks in its own steam or juice, resulting in a less than flavorful food and one that is not browned or seared. Frying pans are an essential kitchen utensil in many households, restaurants, and cafes. Perhaps you need to replace your old frying pan or are setting up your first kitchen in your new apartment or home. 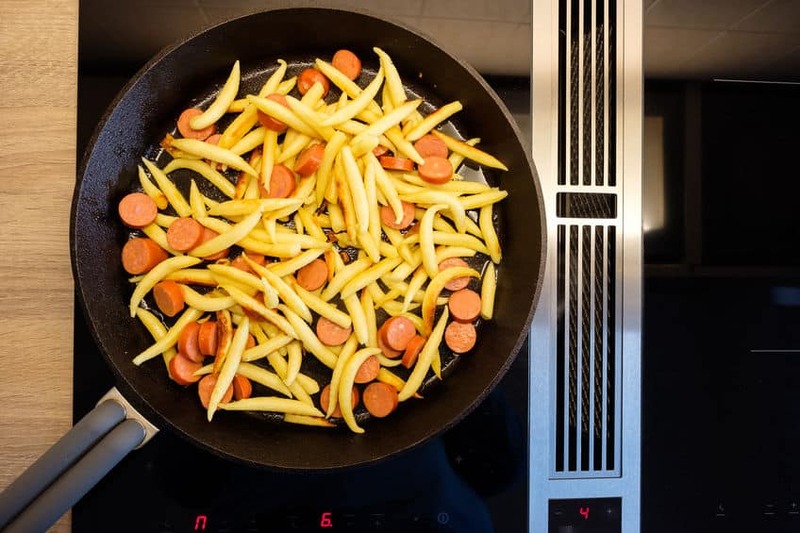 Deciding which fry pan to buy can be time-consuming due to the abundance of options. Should it be cast iron, carbon steel, stainless steel or nonstick? This guide will help you learn about materials used to manufacture many of the frying pans on the market today. 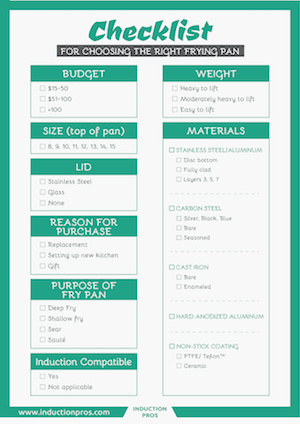 A printable checklist is available to assist in simplifying the process of choosing the right frying pan for your kitchen. You can download the checklist for choosing the right frying pan. The type of cooking you will be using the pan for is an important consideration when selecting a fry pan. If you want to sear and/or fry foods, then cast iron, carbon steel or stainless steel are the best materials. However, if you only need a pan to prepare eggs, pancakes and delicate fish, then nonstick is a viable option. 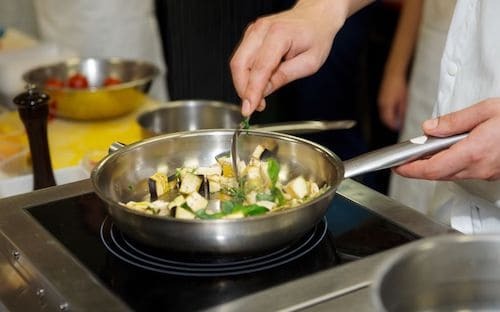 Another factor to consider when selecting a frying pan is the type of cooktop you will be using to prepare your meals. Induction cooktops heat food differently than electric or gas. Induction cooktops have an electromagnetic coil under the cooktops. When the pan is placed on the burner (and the unit is on), current flows through the coil producing a magnetic field around and above the coil. This magnetic field goes through the metal of the pan and moves around inside the bottom and sides of the pan. The pan gets hot and heats up the food inside it. In contrast, gas or electric stovetops use direct contact in the form of either flames or a heating element to heat the cooking vessel. The best magnetic materials for induction cookware are steel, magnetic stainless steel, and cast iron. The stainless steel must contain iron to make it magnetic. Enameled and ceramic-clad pans and pots also work with induction cooktops. A 10” or 12” frying pan can be used to prepare most meals. Depending upon who is using the pan, weight may be a consideration. Some folks opt for carbon steel since cast iron pans are pretty heavy. Budget is a consideration for many folks when it comes to making any type of purchase. Cheap pots and pans tend to dent and warp a lot quicker than the higher priced ones. If price is a constraint then this narrows your options. Stainless steel is an iron-base alloy with a minimum of 10.5% chromium. It also contains nickel, manganese, carbon and small amounts of other elements. Chromium provides corrosion resistance while nickel makes the metal tougher, non-magnetic, corrosion resistant and adds luster. The Society of Automotive Engineers (SAE) is one of many organizations that assigns grades (they use a three digit identifier) to stainless steel. To receive a certain grade designation, the material must meet a certain set of requirements. This gives consumers an idea of what to expect in terms of characteristics such as durability and corrosion resistance. Two common grades for stainless steel pots and pans are 304 and 316. The composition of a pan grade 304 must be 18-20% chromium and 8-10.5% nickel. The percentage of each element is translated into a number sequence, the first being chromium and the second nickel (e.g. 18/10, 18/8). 316 stainless steel has 2-3% molybdenum (304 only has trace amounts) in addition to the chromium and nickel. The higher molybdenum content provides increased corrosion resistance. It is used for medical and marine applications. Some manufacturers stamp the grade on the bottom of the pot or pan while others only advertise that it is either 304 or 316 stainless steel. The process of bonding different metals together under extreme pressure is called cladding. Stainless steel has a lot of great properties, however, it is a poor heat conductor. To rectify this, manufactures add either an aluminum alloy or copper to the base. The result is a pan with great heating properties and one that is durable and corrosion resistant. Two common terms used to describe stainless steel cookware construction are disc bottom (disc clad) and fully clad. Cookware that is disc clad has an aluminum alloy or copper disc sandwiched between two layers of stainless steel. The disc spreads heat around the base of the pan but not up the sides. 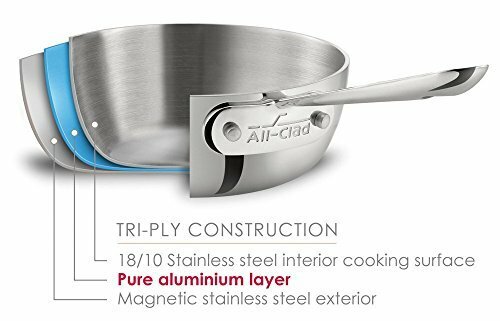 The exterior stainless steel layer is wrapped over the bottom and is either magnetized stainless steel – 18/0, (making the pan induction compatible) or non-magnetized stainless steel. Most manufacturers do not extend the layers to the bottom edge of the sidewalls. 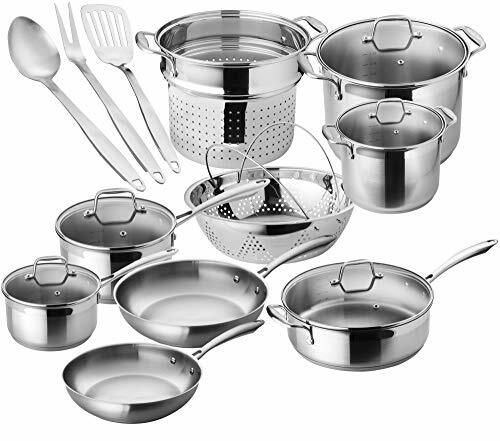 Fully clad cookware (bottom and sides) is made from one sheet of multi-layered metal, (e.g. stainless steel, aluminum, and stainless steel) that is pressed into shape. Generally, the base of the pan will have the same thickness as the sidewalls. In the case of a frying pan, fully clad cookware is preferable since the food is being cooked on the surface and up the sidewalls rather than only on the base as with disc bottom cookware. Fully clad cookware has layers of metal bonded together in a single sheet. Sometimes, the word "ply" is used to describe the layer. The most common metals used are aluminum alloy, copper and stainless steel. The number of layers of metals varies according to the pan. Some have three, five or seven layers and are sometimes referred to as “Multiclad”. While the number of layers is one consideration in choosing a fry pan, the thickness of the conductive layers is also important, especially in terms of heat distribution. Thin layers tend to produce uneven heating because the distance from the heat source to the food is short. However, a thicker pan gives the heat more time to spread sideways before reaching the food. This results in less temperature variation across the pan. Note: a 5-ply pan is not necessarily “better” than a 3-ply pan. The overall thickness is a more accurate determination of quality. If you want a lightweight pan, then one option is to purchase a pan made of only stainless steel. However, if you prefer a pan with some weight to it, then a 3-layer pan is a reasonable choice. Concerns about chemical coatings have led some consumers to use stainless steel cookware. They like the fact there is no coating to flake, chip or peel and the pan is corrosion resistant. Although there is a short learning curve, you don’t have to be a professional chef to learn how to cook with stainless steel. The main tips are: keep the heating level in the low to medium range, properly preheat the pan, and add the oil/fat after preheating. A bonus to cooking with stainless steel is the accumulation of the brown crusty bits, commonly called “fond”, that stick to your pan. These can be used to make a flavorful sauce. Another reason people enjoy cooking with stainless steel is its versatility. A meal can be started on the cooktop and then transferred to the oven. Be sure to check the manufacturer’s use and care guide for maximum oven temperatures. If necessary, the fry pan with leftovers can be placed in the refrigerator once cooled. Unlike carbon steel and cast iron, stainless steel does not react with acidic foods. It is also lighter than those two materials. A high quality stainless steel fry pan will last a long time if it is properly used and maintained. If you decide to part with your untreated stainless steel pans, keep in mind that they are recyclable. Cast iron is an iron-carbon alloy formed from cast molds. It is composed of at least 2% carbon, 1-3% silicon, and with the remainder being iron. This durable material retains heat well and if seasoned properly, is virtually non-stick. Cast iron cookware can be used on a variety of heat sources such as gas, electric, ceramic-glass top or induction cooktop, in an oven, on a grill or over a fire pit. Many people enjoy cooking with cast iron because it is durable, inexpensive, oven proof, retains heat well and is versatile. It is a great choice to sear, sauté, braise, fry and bake food. The only category of foods that cannot be prepared in cast iron are those that are acidic as they strip the seasoning and gives the food a metallic flavor. 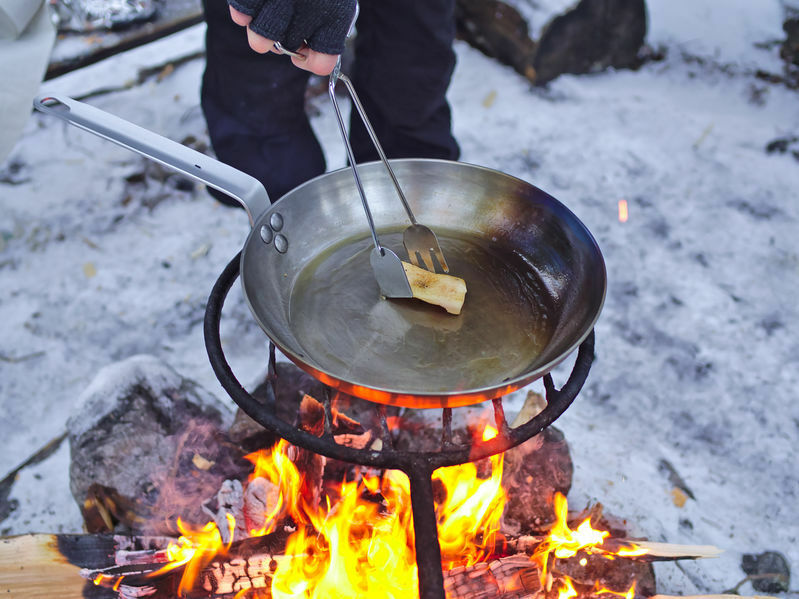 For those who like to cook outdoors, whether in their backyard or at a campground, cast iron is a great option for preparing delicious meals. Consistent use improves the seasoning thereby increasing the non-stick performance. Food inevitably sticks to the very small rough spots on the surface of cast iron pans. When the pan is seasoned, the oil seeps into these places and removes the roughness resulting in a smooth, nearly nonstick surface. Lodge Cast Iron suggests preheating the skillet for a few minutes prior to adding food. Stargazer Cast Iron recommends preheat on low heat for 5-10 minutes before adding food. Some folks shy away from cooking with cast iron because they think it is too difficult or is too time consuming to maintain. However, it is very easy to use and care for a cast iron pot or pan. There are only four steps to routine care: 1) hand washing, 2) drying (to prevent rust), 3) seasoning with a very thin layer of shortening or canola oil (Lodge recommendation) and 4) storing in a dry place. This article details the cleaning and seasoning process for newly acquired cast iron cookware and as well as the process for routine care. Carbon steel is an option worth considering if you are looking for a naturally nonstick frying pan that is smoother and lighter than cast iron. The type of carbon steel used in cookware manufacturing has less than 1% carbon and roughly 99% iron and are formed from large sheets of metal. Carbon steel is durable, retains heat well and is virtually non-stick if well-seasoned and used frequently. It can be used on gas, electric, induction and ceramic cooktops as well as on the grill or over a campfire. These skillets are versatile enough so that you can sear, bake, broil and stir-fry in them. Thickness is an important feature to consider when choosing a carbon steel pan as very thin ones tend to warp under high heat. The thickness of the 12.5” carbon steel pans from high-quality manufacturers such as deBuyer and Mauviel are 2.5mm and 3mm respectively. The handles on these pans are angled, slat-shaped and secured by two or three rivets or are welded. Some handles are at more of an angle than others. Even though carbon steel weighs less than cast iron, these pans have some heft to them. The table below provides thickness and weight data for Lodge 12” Cast Iron and Carbon Steel skillets. The information was provided by Lodge customer service as it was not available on their website. The table below shows where some of the most popular brands manufacture their carbon steel pans. Carbon steel pans have finishes of silver, black and blue. The silver finish is a result of a polishing process during manufacturing and is commonly referred to as “carbon steel”. The black and blue finishes are obtained by heating the carbon steel at high temperatures resulting in a very thin layer of iron oxide. Nonstick cookware is usually made of materials such as aluminum, stainless steel, cast iron, glass and ceramic and has a nonstick coating. The first decision to make when selecting a nonstick fry pan is to choose the type of coating. Even though nonstick coatings have various chemistries, they generally fall into two categories: polytetrafluoroethylene (PTFE)-based and ceramic. Teflon™ is one type of polytetrafluoroethylene (PTFE) coating. Teflon™ was discovered by a DuPont chemist in 1938 and is registered trademark and a brand owned Chemours (formerly DuPont). There has been a lot of controversy about the safety of PTFE. One concern was the potential health risk of one of its ingredients, perfluorooctanoic acid (PFOA). Chemours, the manufacturer of Teflon®, no longer uses PFOA in its coatings, (since 2013) nor does any reputable chemical company (since 2015). Another issue is the potential human health risk when a cooking vessel with a PTFE based coating is overheated. According to Chemours, cookware with Teflon™ nonstick coating should not be heated above 260ºC (500ºF). 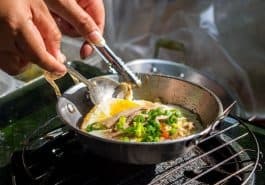 The American Cancer Society states there are no known risks to humans who use Teflon-coated cookware unless the pan overheats. They too report that if a person breathes in fumes produced by overheating, they might experience flu-like symptoms. Another PTFE safety issue often discussed is the potential health risk associated with cooking on a scratched pan or consuming flakes of PTFE-based coatings. The long term effects, if any, of consuming PTFE are unknown. Does the pan have a “PFOA-Free” designation on the pan or the box? 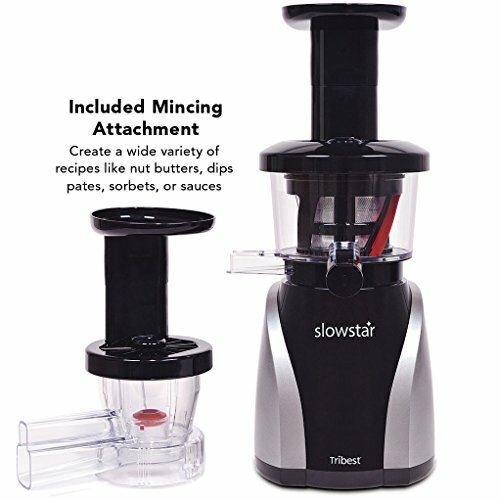 Is the manufacturer a reputable company? It is important that the coating is properly bonded to the pan so that it will not flake off or scratch easily. Plan to heat your skillet above 260ºC. Plan to use this fry pan to sear protein. Are concerned about the potential and unknown health effects of PTFE. Do not heat the pan over 260ºC. Use low to medium settings. Do not leave cookware unattended on a heated cooktop. Always heat the pan with something in it as an empty pan can quickly reach high temperatures. Consider the weight of your pan when heating. The ones that weigh less, heat faster than the heavier pans. Don’t use aerosol cooking sprays. Using wooden, silicone or plastic utensils reduces the chance of scratching. Allow the pan to cool after cooking. Hand wash with a soft sponge and warm, soapy water. Turn an exhaust fan on or open a window to clear any fumes. Most people do this whether or not they are using PTFE coated pans. Throw out pans that are flaking, peeling, or in an abundance of caution, those that are scratched. Throughout the last 60 years there has been an evolution in the materials used in the construction of nonstick cookware. One example is the development and manufacture of products with ceramic nonstick coatings. These coatings are bonded to a cookware substrate such as hard anodized aluminum. Most ceramic nonstick coatings are made from inorganic (no carbon) minerals, mainly silicon and oxygen (many ceramic coatings are derived from sand and quartz is the most common mineral in sand; quartz is composed of silicon and oxygen atoms). There are various brands of ceramic nonstick coatings. We take a look at these three popular coatings: GreenPan’s Thermolon™, Cuisinart’s Ceramica™ and Weilburger’s Greblon®. In 2007, The Cookware Company, a Belgian company, introduced the first PTFE-free ceramic nonstick coating, Thermolon™. GreenPan, a higher end brand, makes nonstick cookware coated with Thermolon™ as does GreenLife™. This coating is derived from sand, transformed into a sprayable solution, sprayed onto the body of the fry pan and cured in the oven. Thermolon™ free of PTFE, PFAS and PFOA, lead and cadmium. Recently, GreenPan completed their 5th evolution of coatings. The Thermolon™ coating is now reinforced with diamonds making it more durable and resilient. Another ceramic nonstick coating is Cuisinart’s Ceramica™. It was first used in their GreenGourmet line, which debuted in 2008. The body of the pans are hard anodized aluminum and the coating is PTFE and PFOA free. A titanium reinforced ceramic nonstick coating is also offered by Cuisinart is CeramicaXT. It too is PTFE and PFOA free. Cuisinart claims there is no need to add oil or butter to prevent foods from sticking when using pans with this coating. Weilburger uses their brand, Greblon®, to market various coating system solutions such as fluoropolymer, polymer and sol-gel technology. The cookware industry is one of the many that uses Greblon® products. Greblon® offers ceramic coatings that are PTFE free as well as coatings derived from stone that are PTFE based. The Greblon® coating system used on the 12 inch Green Earth Fry Pan by Ozeri is free of PTFE, PFOA, lead and cadmium. The coating for this particular pan is made in Germany and then shipped to China for final assembly. 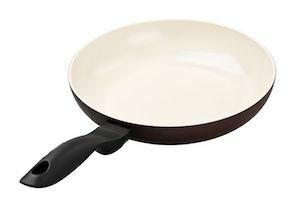 The Stone Earth frying pan by Ozeri has a PTFE based Greblon coating. This APEO and PFOA free coating is also manufactured in Germany. Anodizing is a method of changing the chemistry of the surface of a metal such as aluminum. This hardening process improves the corrosion resistance of the aluminum alloy, the adhesion of subsequent coatings, and the pan’s durability. Anodization is accomplished by submerging a metal such as aluminum, in a strong acid and charging it with an electrical current. The ensuing electrochemical reactions causes pores to form on the surface of the aluminum and then erode down into the substrate. The aluminum then combines with O2 ions to form aluminum oxide. As current continues to be applied, the weak areas of the pores go deeper into the substrate. A series of straw-like hollow structures is formed. Once the required depth is reached, the process is stopped, and the substrate is rinsed in water to seal the part. The result is a hard, natural aluminum oxide coating that is corrosion resistant and durable. Hard anodizing means the electrical current was applied until the pores were greater than 10 microns deep. Sometimes the depth can be 25 microns or more. This increased pore depth offers more corrosion protection and durability. Some hard-anodized pots and pans have PTFE based coatings. For example, the Anolon Nouvelle Hard Anodized line is coated with Chemours Autograph® 2, which contains PTFE. In contrast, Cuisinart’s GreenGourmet Hard Anodized Nonstick cookware is coated with Ceramica®, which is PTFE and PFOA free. What happens if the PTFE coated pan is overheated or cooked dry? The pan may reach a temperature high enough that PTFE will break down and emit fumes. Does PTFE react with other chemicals? Perfluorooctanoic acid (PFOA), a man-made chemical, was used in the process of making PTFE. It is no longer used by Chemours, the maker of Teflon® or other reputable manufacturers. Why did DuPont add PFOA to PTFE? PFOA was added to PTFE to smooth out the lumps in the freshly manufactured Teflon. Why did DuPont and other chemical industries stop using PFOA? The chemical industry and the U.S. EPA and other regulators agreed there were negative environmental and potential health impacts of PFOA. This summary details the history and health concerns of PFOA. However, according to the EPA Scientific Advisory Board, there is not sufficient evidence to conclude that PFOA has the potential to cause cancer in humans. When did DuPont, now Chemours, stop using PFOA? The use of PFOA was completely discontinued in 2013 by Chemours and by other chemical industries in 2015. What chemical is Chemours using as a replacement for PFOA? According to an EPA report released in November, 2018, they are using GenX technology. Gen X is a brand name for technology that is used to make fluoropolymers without using PFOA. Is GenX technology less toxic than PFOA? The EPA completed a “draft assessment” for GenX chemicals focused only on the potential human health effects associated with oral exposure. “The draft RfD [reference dose] for GenX chemicals suggests that they are less toxic than PFOA and PFOS. Overall, the available oral toxicity studies show that the liver is sensitive to GenX chemicals. When overheated, PTFE coatings can degrade and release fine particles and gases. When you’re planning to purchase a cooktop, you want to ensure whatever you get is the best it can possibly be and is easy to operate. 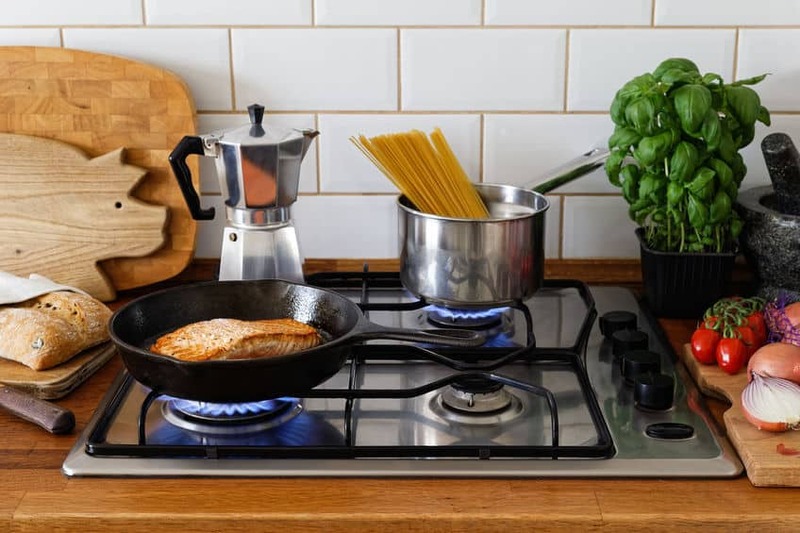 Before purchasing your specific cooktop, there are many factors to consider such as price, the amount of space available in your kitchen, and the features that will be beneficial for you. 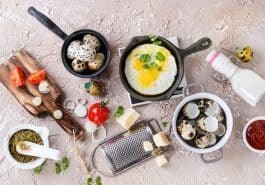 There is often a lot of confusion between ceramic cooktops and induction cooktops and although they look alike there is a big difference when it comes to cooking and how they work. That’s why we thought it would be helpful to supply you with this guide of the differences between the two. The main difference between a ceramic and induction cooktop is how they create heat and how it spreads and transfers into the pot or pan. Under the glass/ceramic surface of an induction cooktop lies a coil through which electric current flows. A magnetic field is created which goes through the bottom of the induction compatible pan or pot that sits on the surface of the cooktop. A current is then generated in the base of the cookware. This electrical energy is changed to heat energy which is transferred from the vessel to the food. Underneath the top of the ceramic/glass cooktop lies coiled metal elements. These elements are heated to the set temperature. The coils heat the cooktop surface and then heats the cooking vessel. Finally, after heating the ceramic surface of the cooker, the heat is transferred to the pan. Compared to each other in terms of how they heat up pans, we would say that the induction cooker wins, as it is more efficient as it only heats up the pan itself. One of the main features to consider before buying a new cooker is its safety. This is an essential part of the purchase process, especially if you have young children. While ceramic cooktops retain considerably more heat than induction cookers, there are now a lot of modern models that come with a heat indicator that tells the user the hotter parts of the cooker. 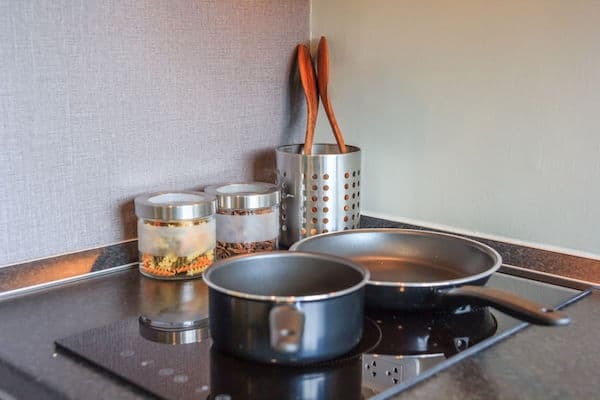 However, induction cooktops are ideal for homes with small children as the top hardly gets hot, and is only activated if it is switched on and an induction ready pan or pot is on the top of the cooker. Some models have a lock feature that when activated, prevents settings from being changed. Ceramic cooktops also offer safety features which vary according to the model selected. 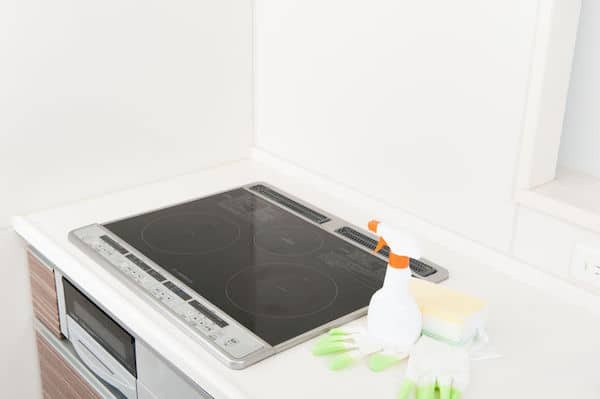 While both a ceramic and induction cooktop are both flat and smooth, thus making them equally as easy to clean (you can normally just wipe them down with the wet cloth), there is the issue of ceramic cooktops being hot and if anything is spilled on the top of it while it is hot, it can dry or bake onto the surface. In this case, it is essential that you clean it up as soon as you feel it is safe to do so. If burnt or spilled food is left on the cooker top for a while it can cause more problems in the long run. Another factor to consider before purchasing or choosing your model of the cooker is the cookware you will use. Induction cooktops require certain cookware pieces. Therefore, if you already have a collection of cookware in your house, you can use the magnet test to see if they’re compatible (if the magnet sticks securely to the base of the cookware then it is induction ready). If your pots and pans aren’t compatible, then you will have to consider the expense of new cookware. However, all types of cookware can be used on ceramic cooktops – as long as it has a flat bottom. 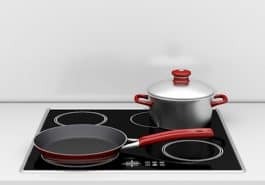 Overall, there are some differences between the ceramic and induction cooktops, but both are unique and it is ultimately up to personal preference which one you opt for when you purchase your cooker. 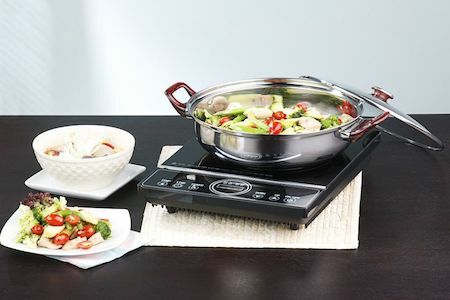 Some consumers purchase a portable single or double induction cooktop. They are much less expensive than built-in or full induction and ceramic cooktops. Induction hobs heat a cooking vessel electrically by magnetic induction, as opposed to a flame or an electrical heating element. A portable induction cooktop is perfect for a home or office kitchen, RV, boat, cabin or dorm room. As the benefits of these cookers become more well-known, commercial establishments such as food trucks, convenience stores, and restaurants are using them to prepare food. Induction cooktops designed specifically for commercial use are available as well as built-in and full-size units. What Cookware Can Be Used on an Induction Hob? 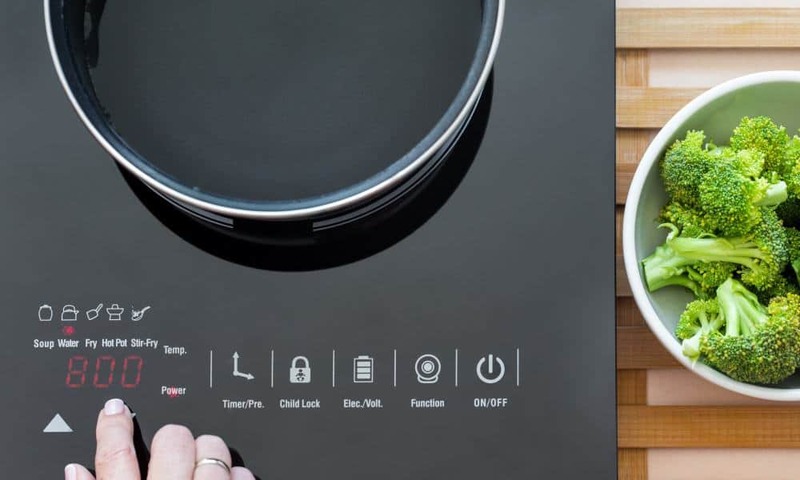 An induction compatible cooking vessel is placed on the glass ceramic surface of the induction cooktop. Underneath the cooktop are electromagnetic coils made from copper wire. When the unit is switched on, an electric current flows through the coils. This produces a magnetic field which generates electric currents in the pot or pan's metal. The base of the pan will be heated directly. Heat is transferred to the food because the cooking vessel acts as a heat source. The only part of the glass ceramic surface that is heated is where the pot is contact with the induction hob or if there is heat given off by the cookware. Only ferromagnetic materials such as steel, magnetized stainless steel, enameled cast iron and cast iron work with induction cooktops. 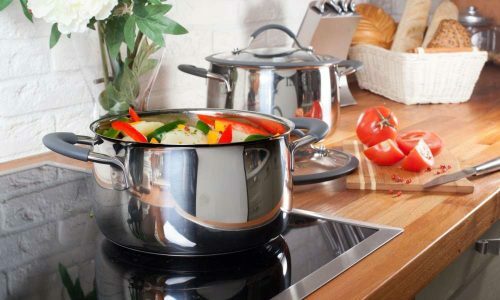 As induction cooktops become more popular in the United States, companies are manufacturing cookware that can be used on conventional stovetops such as electric or gas as well as induction hobs. They simply place a layer of magnetic stainless steel in the base of the cooking vessel. This provides the consumer the versatility of using it on several heat sources. 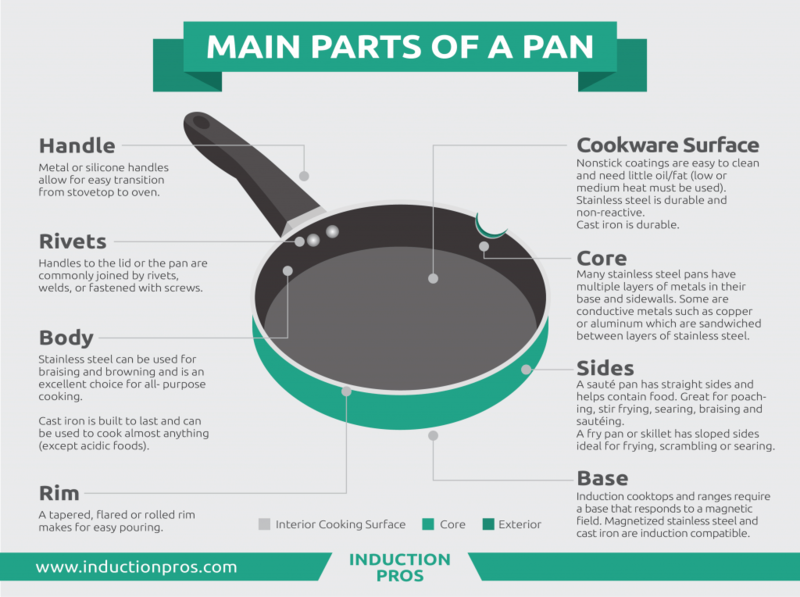 It is easy to determine if your pans and pots are induction ready or not. Place a magnet on the bottom of your cookware and if it sticks strongly to the base, it is induction ready and can be used on your induction cooker. If the magnet has no pull toward the base of the pot or pan, then it doesn’t have the metals needed to create heat with an induction cooker. Reacts quickly to a change in temperature/power settings. Less heat is wasted since more heat goes into the pan than electric or gas stoves. No electrical heating element or flame. A variety of safety features are available depending upon the model. If someone uses a wheelchair, it is certainly easier to use a portable induction cooktop since it can be placed on a table enabling easy access since the user's legs can go below the table. Some people complain about fan noise while others don't find it annoying. If you don't have compatible cookware, then the additional cost of new induction ready pots and pans has to be factored into your decision. The full-size ranges are expensive. However, some consumers view it as an investment rather than a one-off purchase. Most cookers automatically shut-off after 2 or 3 hours. There has been a lot of hype about induction cooktops being much more energy efficient than an electric or gas range. Most people will agree that since heat is transferred directly to the pot, little is lost to the surrounding environment. This means your kitchen won't get so hot, which is great during the summer. In addition, induction cookers heat up faster than electric or gas stoves and react more quickly to temperature changes. The question as to whether using an induction cooktop is less expensive than electric or gas has been discussed on various review sites and forums. Prior to stating whether the cooking efficiency of induction cooking is or isn't better than electric or gas, I wanted to review the results of a technical assessment that addressed this query. I found one that was conducted by the private firm, Electric Power Research Institute (EPRI). The cooking products used were: full-size gas and electric ranges and two single burner induction cooktops. Water was heated from 70° to 200° F to conduct the electric and induction tests. Three tests were completed and the results averaged. In terms of electric vs induction, the results showed when the cooking vessel covered the burner, induction efficiency was higher (83.4% vs 77.4%). On the other hand, when the bottom of the cookware was smaller than the heating coil, induction was more efficient, (76.2% vs 41.5%). In the end, the amount you would save on your electric bill is negligible. The induction cooker was originally produced and put on the market in 1933 at the World’s Fair in Chicago. During the fair, several demonstrations were conducted showing how to use the cooker, along with an explanation of the different types of cookware that can be used on an induction cooktop. Then, in 1970, more modern developments of induction cooking developed in the United States. Since technology had moved forward, improvements were made and the induction hob became a lot better and more popular with the general public. Westinghouse developed an induction cooker (including matching and compatible cookware) and started selling it to the public. 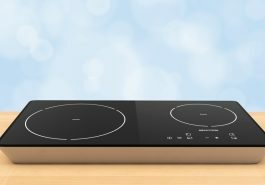 However, there were many problems with induction cooker technology and the idea of them never really took off in the US during this time. It has only been since the fan noise has been reduced in induction cookers that it has become more popular. While induction cooking failed in the US (during its first few years of being in the market), it thrived in Europe and Asia. As technology advancements in many different areas were taking place, a few companies invested development money in the area of induction technology. Slowly, these products became more well known and understood in the United States. Sales increased when companies reduced the fan noise (although not enough according to some consumers) and manufactured products with fewer reliability issues. The concepts of minimalism and living in small spaces has given induction cooking more visibility. 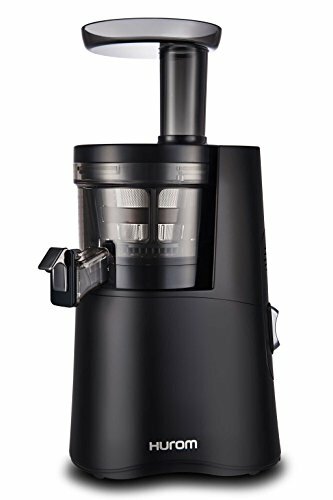 Appliances such as these are of interest to those who prefer a modern looking kitchen as well as those who are curious about products with newer technology. Induction cooking is an interesting way of preparing your meals. It does take a little getting used to, however, given its benefits, it's certainly something worth considering. The decision as to whether to add a portable single or double burner cooktop, a commercial induction cooker, a built-in unit or a full-sized induction range to your kitchen, boils down to your cooking style, budget, and what works best for you.